This category could have been called “arts and crafts,” but something about that lacked zing. Anywho, it focus on things I’ve made, from the whimsical to the serious: drawings, furniture, and the like. Enjoy. It’s easy to see my influences, chiefly XKCD, a great comic written by Randall Munroe. 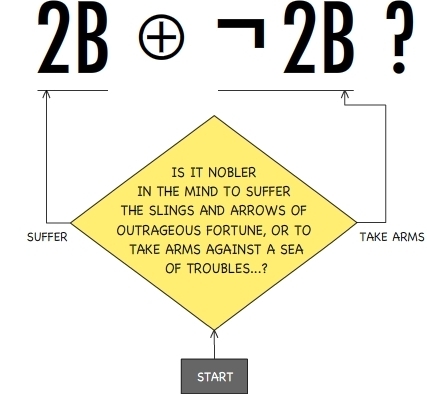 Let’s just say, he seems to love flow charts as well. Recently, my wife and I have been reading each other bedtime stories. We started with The Hobbit , next it was The Princess Bride , and currently we’re working through The Phantom Tollbooth . Coincidentally, all of these books included a map. This got me thinking about how much I love maps, and that got me thinking about the map above. I penned it with a great deal of help from my law school classmates back in my 1L year. The map was our section’s gift to contracts professor Ward Farnsworth. At the time, I shared a poor-resolution image over Facebook, but the nostalgia conjured by my bedtime reading and their maps quickly transferred to nostalgia for those heady days and nights studying away at the law tower–hence this post. You can click on the image above or here for a closer look. 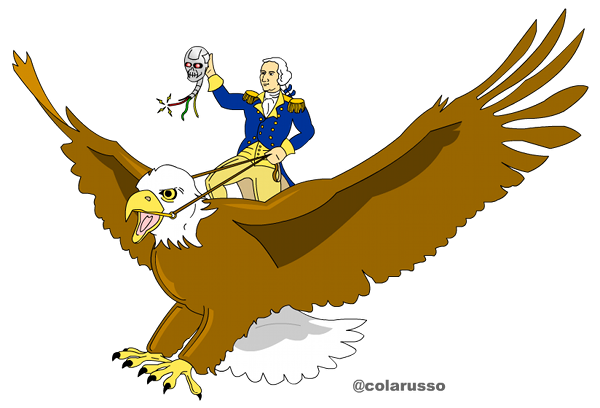 The original was framed and given to Professor Farnsworth, and this cell-phone picture is the best image I have. In fact, it’s not even a picture of the final version as we added at least one case (showing travel in a covered wagon) after snapping it. 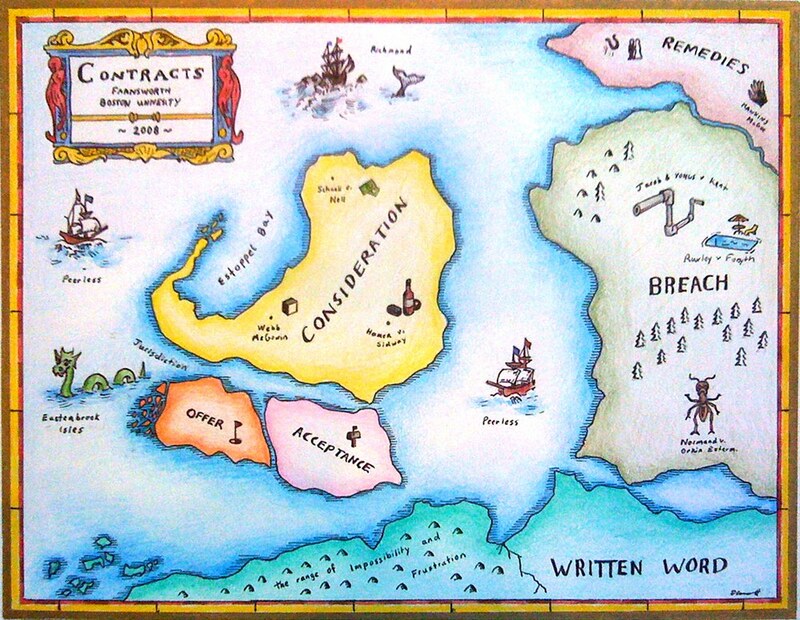 The map depicts a land of Contracts, with territories mapping roughly to the topics covered in class. Cities bear the names of cases, and occasionally items such as the Peerless are what they were (e.g., two ships bearing the same name). The cases were drawn from a book Professor Farnsworth was preparing on the subject, and it occurs to me that should he like to include such a map in future editions, I would gladly pen one. Last week’s doodles gave birth to this. For an explanation and a larger image, click here or on the image below. Dave with his aviators, striking his best pose. I’ve been out in Marlborough this week for training at the Best Western. Our days have been packed full of classes on the Fifth Amendment, addiction, car stops, and field sobriety testing. It’s a reunion of sorts for the attorneys who started at CPCS back in October of 2011, and I’ve been happy to reconnect with my training cohort, including a few classmates from BU. Of course, when faced with day-long training sessions, it’s important to develop strategies to help take everything in. I happen to be a big doodler, and there’s at least some evidence to suggest this is a good thing. Luckily, the Best Western provides us with fresh note pads everyday. Tom and Jeff, guys with glasses and great hair. The video below is a bit of a departure from my usual science fare. It shows the construction of a bookstand modeled on one found in Thomas Jefferson’s office at Monticello, and it was a lot of fun to make.